#13 – Lost Legacy: Third Chronicle – What's Eric Playing? August 31, 2015 November 14, 2016 • What's Eric Playing? I’m excited. I’ve been waiting for this expansion since it was announced, and I bought it from some sketchy website as soon as I could so that I could get my hands on it as soon as possible. Lost Legacy remains one of my favorite games, so how does this expansion measure up? Where does it succeed? Does it fail? Lost Legacy’s Third Chronicle: Sacred Grail and Staff of Dragons is, as you might guess, the fourth set in the Lost Legacy series, continuing from The Starship, Flying Garden, Whitegold Spire, and Vorpal Sword. The latter two were combined and sold as the Second Chronicle because apparently people didn’t realize you were supposed to buy more than one deck and mix them together while removing one of the Lost Legacies. To be fair, not especially clear. Regardless, Sacred Grail tells the timeless story of a beloved king of a realm who has a magic cup that grants him and his loyal knights powers, despite King Arthur already being in the public domain. Seriously. You can use it for free. Staff of Dragons tells the story of a world fraught with peril, as one woman who can speak to dragons or something tries to settle a conflict between tribes that have dragons and I think this whole thing is a Game of Thrones reference but honestly it’s anyone’s guess. Though, in keeping with their current theme, they’d probably refer to it as a Gambit of Fancy Chairs, which I’d actually watch. If you’d like to read about the other Lost Legacy Chronicles, check out my reviews of The Starship, Flying Garden, and the Second Chronicle and the Fourth Chronicle. Anyways let’s talk about setup. 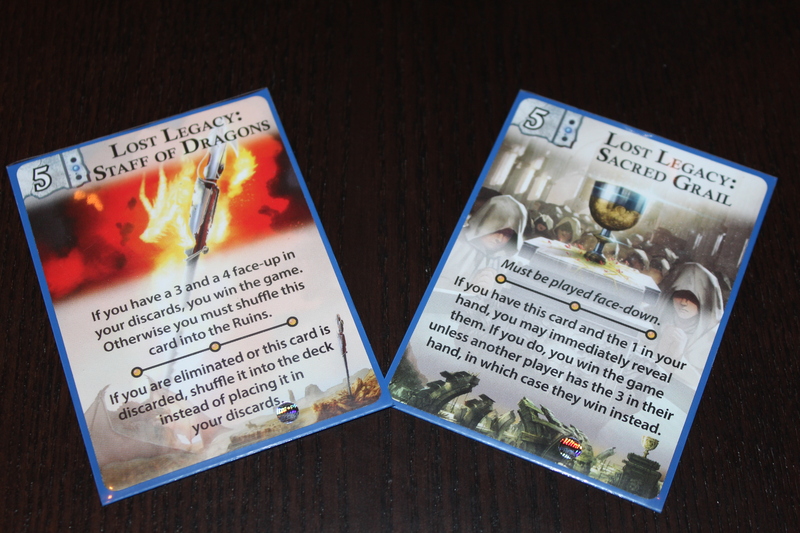 In case you missed the previous Lost Legacy post (in which I mistakenly combined the First and Second Chronicle, leading to a 4000+ word treatise), I’ll re-go over the rules and general setup, but with different cards. 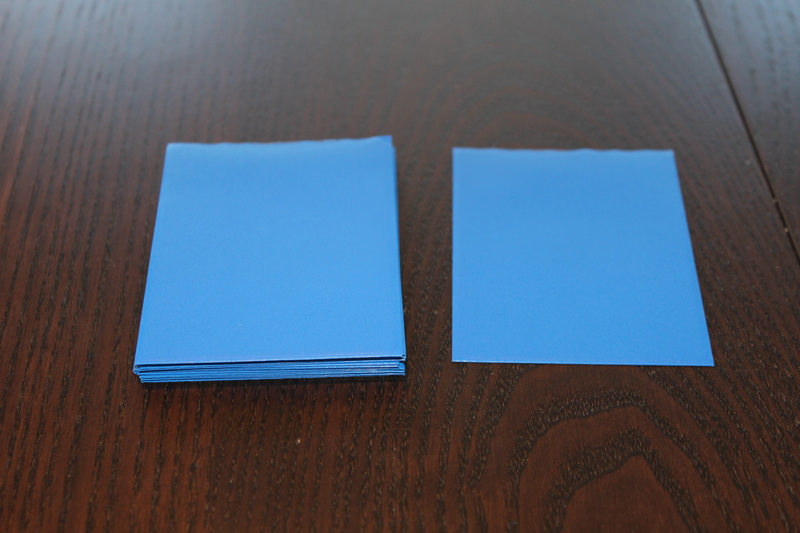 You should notice that there are TWO decks within the box, each having a different bottom. Look at the top of this post for an example. One set has a fancy cup on the bottom — that’s the Sacred Grail deck. The other has a staff on the bottom — that’s Staff of Dragons. Separate these two, since you probably won’t want to mix two sets for your first game. You know what the worst part is? This is the same photo as last time. Now that all the cards are set up, let’s begin. You add a card to the Ruins! Play a card next to (horizontally) the current cards in the Ruins. Don’t play them on top and don’t mess with the ordering — it can be pretty crucial. If there are no cards in the Ruins, start a new Ruins next to the deck. You are eliminated! Rough times. Discard your card face-up in front of you. You have not won. Your opponent is eliminated! Hooray! Their death brings you one step closer to finding the Lost Legacy. Unless, of course, they were the last person in the game that wasn’t you. If that’s the case, you win! Hooray! Nothing of real significance! If so, your turn ends. Hooray! Once the deck has run out of cards, you switch to what’s called the Investigation Phase. Now, those of you at home who are paying attention but managed to miss my previous explanation on the topic (how?) will note that I already referred to the numbers on your cards as investigation speeds, which might make you think these two are related. You are correct! The lower your investigation speed, the sooner you get to investigate. Now, you might ask yourself, what are you looking for? The answer is simple. One of these! Or Lost Legacies from other sets, depending on which decks you’re playing with. If you have an X in your hand when the Investigation Phase starts, you DO NOT get to investigate. X is not a number, silly Romans, so you never get called. This is sad. You have not won. If you have the same investigation speed as another not-eliminated player, you DO NOT get to investigate. It’s unclear why this is the case, but them’s the rules. This is sad. You have not won. If nobody finds the Lost Legacy during the Investigation Phase, EVERYONE LOSES. This is double-sad. Nobody has won. However, if you find the Lost Legacy when it’s your turn to investigate, you HAVE won, and you win! Hooray! A lot of this is rehashed from the previous post on this. Do not let people know what cards you have in your hand. 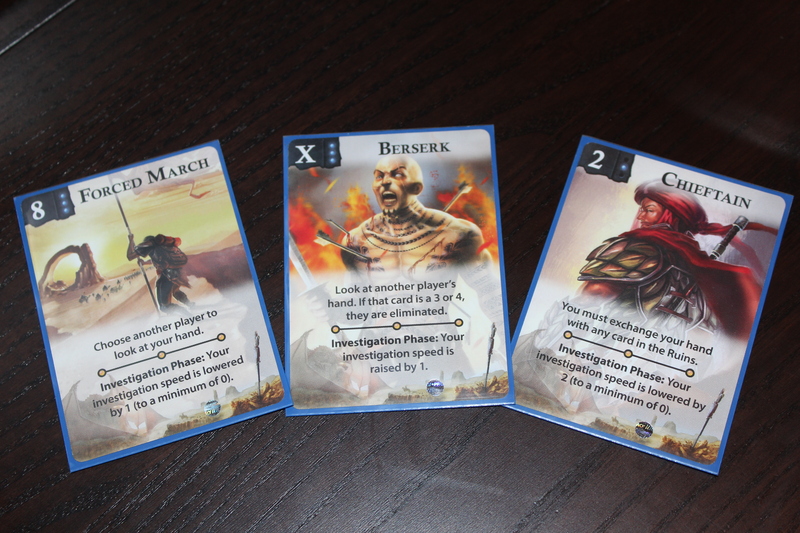 Many cards (False Grail, Berserk) eliminate players with specific cards, so it’s usually a bad idea for someone else to know what card you have. If someone sees it, try to play it on your turn. Especially if it eliminates them instead. There’s an old saying that the best way for two people to keep a secret is if one of them is dead. Just a thought. Play fast, play loose. This is not a very serious game, and often you get unfortunate combos (especially in two-player games) where one person just automatically loses. This is a light game, so try to play it that way. It’s okay to spend an entire game devoting yourself to revenge against the person who beat you last game; in fact, that’s usually how I play. You have not played any cards yet. You played a card face-down last turn. You played an X last turn. Try to keep that in mind so you’re not telegraphing what cards you’re playing. Otherwise, the game becomes pretty easy. You usually cannot play the same card two turns in a row. 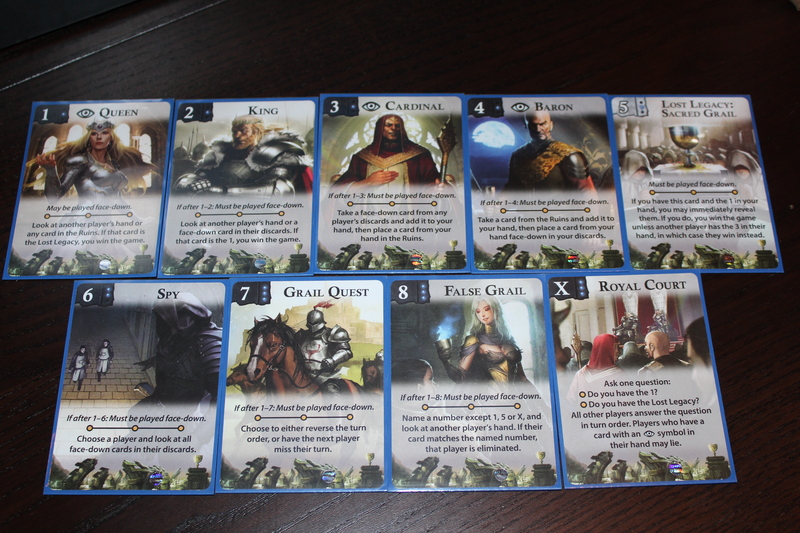 I’m looking at you, Grail Quest (7) and False Grail (8) — if you play one on your turn, you cannot play the same card again because its investigation speed is within the range specified on the card. A lot of people get tripped up with this. You can only play a card face-up if it’s an X, you haven’t played any cards yet, or if its investigation speed is strictly lower than the last card you played. That’s how I think about it and it helps a lot to simplify the gameplay. 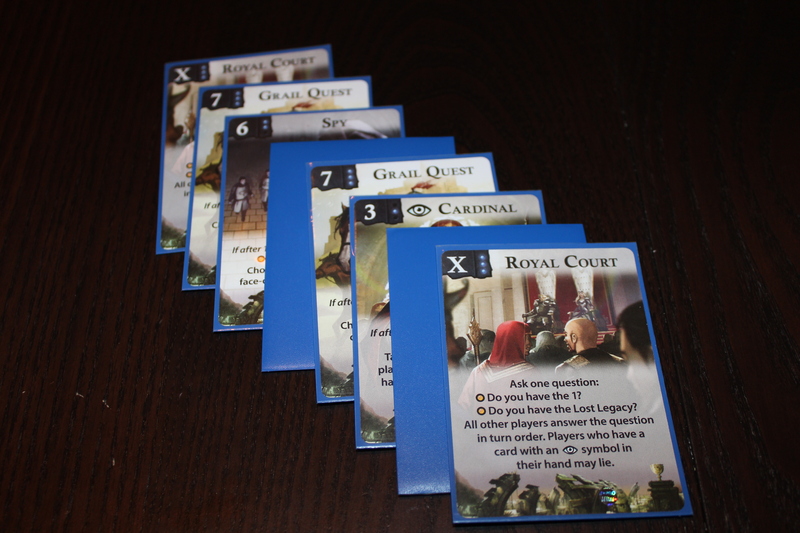 And, basically, they allow you to lie when the Royal Court (Sacred Grail X) is played. That’s kind of fun, because it’s usually just designed to annoy other players. However, this does not work with cards that are not from this set. For instance, if you have the Sister of Fate (Starship 1) or Alchemist (Whitegold Spire 4) or something you can’t lie if you’ve combined the two decks and someone plays Royal Court. That’s a bit weird, and is often the problem with expansions that introduce new elements. Anyways. Make sure you know what card you played last. Many players get really frustrated when they’re about to eliminate someone with False Grail, only to realize they played False Grail last turn and so they can’t again. Check yourself before you wreck yourself. Never ask if someone has the 1 when you play Royal Court. Seriously, that tells you nothing. At least if someone says “No” when asked about the Lost Legacy you know they don’t have it (why is left as an exercise for the reader). Remember. If someone says “Yes” to having the Lost Legacy when asked via Royal Court, they have either the 1, 3, 4, or 5. That’s a lot of cards they just admitted to NOT having, which is handy. Same goes for them saying “Yes” to having the Queen. They have either 1, 3, or 4. That’s why most people just say no. It means they could have literally any other card, but if they have the Lost Legacy and are asked they cannot lie. Always keep the Cardinal. Just for the hilarity of stealing someone else’s win. It’s worth it. The Lost Legacy card in this game is pretty great. It’s a weirdly unexpected synergy between a few cards, and it’s super fun to play with. Intrigue adds just enough bluffing to be entertaining. It’s silly bluffing because it doesn’t contribute much, but it’s still pretty fun. Very unique playstyle for the set. It’s still Lost Legacy and it still feels like it (unlike Whitegold Spire), but I think it’s very much a good standalone expansion for the game. I play it pretty often as a result. 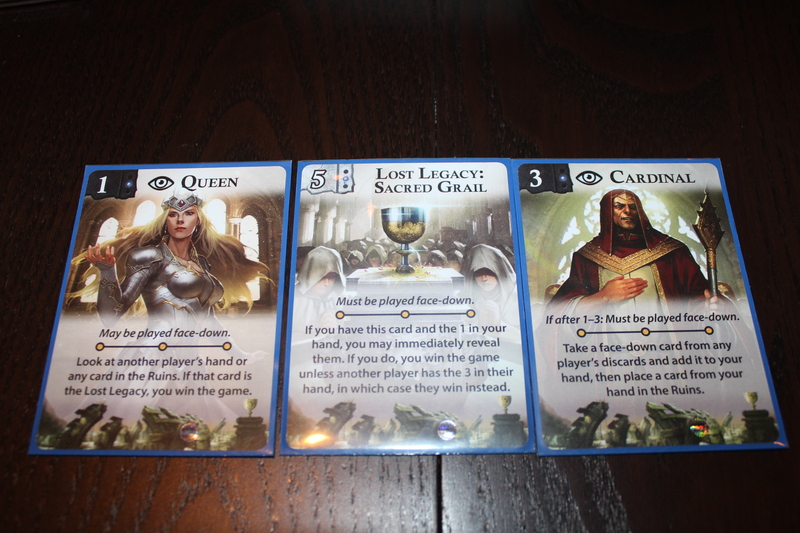 Reversing the turn order (an option on Grail Quest) doesn’t really make much sense, usually. It’s almost always better to skip the next player, in my opinion, since that means you get an extra turn, and it makes it hard to remember turn order if you reverse a few times. Restrictions on False Grail are a bit weird. Not being allowed to guess an X is kind of a staple, but a 1 or a 5 doesn’t seem necessary to block, but I suppose it’s thematic. Who knows? Players get super confused by playing cards face-up / face-down. This leads to a lot of games messed up by someone revealing a card and realizing they have to play it face-down instead of getting to play it at all, so it’s clearly not the Lost Legacy. It’s a bit of a bummer, strategy-wise. Doesn’t really mix well with other decks. With the face-up/face-down things and the Intrigue not really being carried on by any other expansions, it’s not super useful to mix this deck with other decks because it doesn’t really add much to another deck. It just makes the other deck a bit more confusing. The only deck it synergizes with at all is Whitegold Spire, and even then that just makes investigating impossible because you could have 10+ cards face-down in front of you. Honestly, as a standalone expansion this game is pretty great! I’d highly recommend it. It’s short, it’s sweet, the theme is fun enough and it plays quickly and well without ever feeling too cheap or obnoxious. Sometimes you get lucky, more often than not you don’t. It starts to struggle a bit when it’s paired up with other expansions, but I don’t think that takes away from how fun it is overall. Like I said, check it out. Alright; let’s talk about Staff of Dragons a bit before the overall Third Chronicle rating. I hope you like math. Staff of Dragons is even weirder. Hopefully your addition and subtraction skills are on point, but even worse you better be able to divide quickly, because these dragons have a flair for the mathematical. Forced March lowers your investigation speed by 1 (to a minimum of 0). Berserk raises your investigation speed by 1 (no maximum). and Chieftain lowers your investigation speed by 2 (to a minimum of 0). Note that these stack, so you can cancel out two Berserks with a Chieftain or end up with an investigation speed of 0. However, the same rules apply — if your investigation speed is the same as another player’s during the Investigation Phase, neither of you get to investigate. Plan accordingly. Additionally, the 7 (Negotiation) lets you move cards around, so it may behoove you to place cards in other players’ discards in the hopes of getting their investigation speeds to collide. will eliminate you if your discards have a total value divisible by 3 or 4, respectively. For some reason the game asserts 0 is not divisible by 3 or 4, which is … fine. 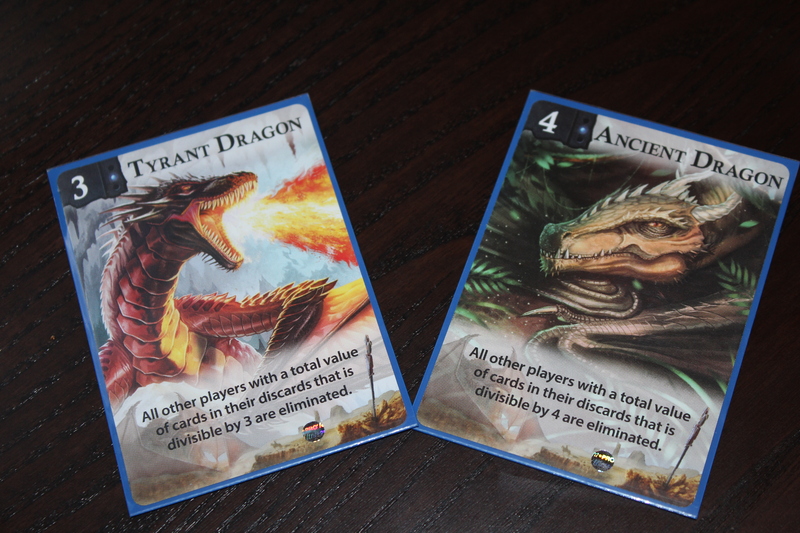 Suddenly, playing an 8 on your first turn becomes a lot more dangerous, because you’re setting yourself up to get mathblasted by the Ancient Dragon (4). 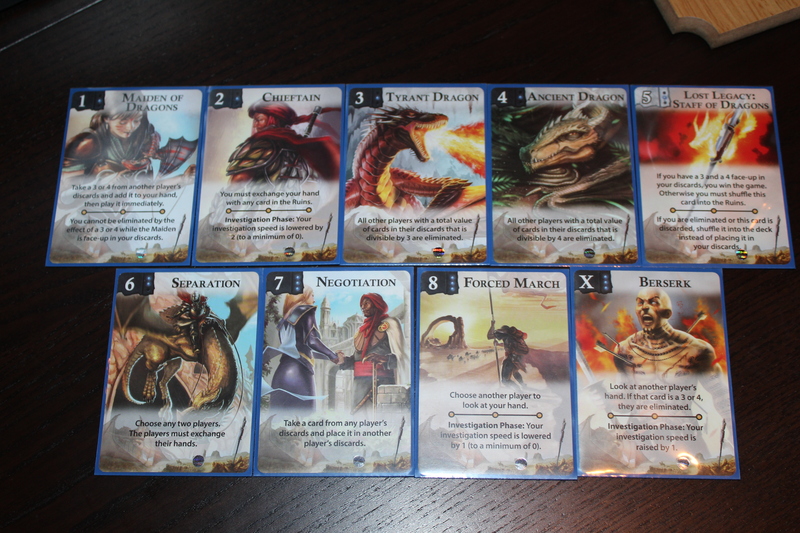 Also note that the dragons eliminate all other players whose math displeases them, so you might actually wipe out several players with one card (a first for Lost Legacy!). The only thing that can protect you from these dragons is the Maiden of Dragons, whose presence in your discard pile can prevent them from harming you. That, or prime numbers, which as everyone knows are a true dragon’s only weakness. The interesting thing about these cards is that you have the potential to be able to alley-oop someone if you’re playing with more than two players. 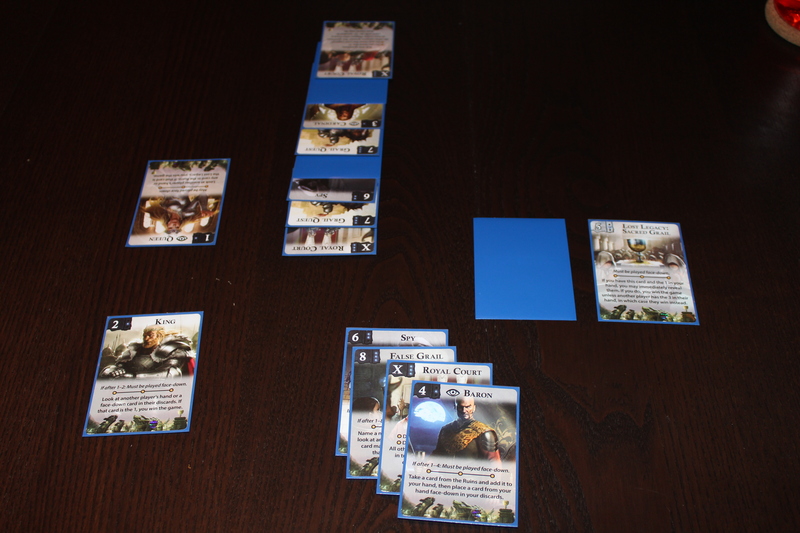 Player 1 Negotiates (7) Player 3’s discards such that they’re divisible by 3 or 4, then Player 2 plays a dragon to eliminate them. It’s quite neat. Learn math. Seriously, please don’t sit and count your cards every time you need to place something. Keep a running total of your cards and know your factors. Negotiation is key. Usually giving someone an easy target to snipe with a math dragon is fair play, so try to use your 7s to move cards around so that other people have 3- or 4-divisible piles. Try to keep your discard pile prime. It’s helpful. Forced March is, perhaps, one of the worst cards in the game. Try to avoid ever playing it. It just forces you to show someone else your hand, which is pretty much always bad. The only time I can think of playing it would be if I’m the last player to go and I show someone that I have a low card that isn’t the Lost Legacy. Then I get -1 to my investigation speed without either showing them the LL or getting eliminated. Or if I have an X. Or if that makes my discards safe. But it’s rare! Who ever thought that math could be so fun? Or so thematic? Nobody. But it’s hilarious. The investigation speed modifiers make the game really interesting. Suddenly it’s no longer about having the best card, but also about making sure nobody’s going to collide with you (especially with 0 as a hard minimum). Separation (SoD 6) is a great card … if you have more than two players. It’s pretty fun to force other people to swap hands. One of my favorite decks to combine with other decks. More cards is just fuel for the Math Dragons. Given that Forced March forces you to show someone your hand, this set is extremely violent when combined correctly (ie with any set that lets you eliminate another player if you can guess what card they have). A lot of instant win/loss situations, here. Did Player 2 draw a Math Dragon and Player 1 Berserk? Okay! Play again. Bit of a bummer, but what can you do? This happens a fairly nontrivial amount of the time. The actual Lost Legacy card is terrible. In order to win with it, you have to get the 3, 4, and 5 all played (in very nearly that order) in a game designed to steal those cards and shift discards around. I have never seen someone win with this, and it’s honestly kind of frustrating. I think it would be much better if you could only win with the Staff of Dragons if the 3 and 4 were currently in other players’ discard piles. Then it suddenly becomes this weird dance to try and get them out of your pile, not in, which seems much more complex / entertaining. We might house-rule that. I actually like this deck a lot because of how well it combines with the Vorpal Sword expansion to create a hyper-violent megadeck that’s all about elimination. You either get cut down by the Vorpal Sword or the Math Dragons eat you alive with numberrage or whatever Math Dragons do. As a standalone it’s honestly not particularly amazing, unfortunately, but weird synergies happen when combined with other decks. Suddenly using Negotiation (SoD 7) to move Medusa (VS 1) to another player’s discards means that forcing another player to play Medusa may no longer be a good idea, for instance. Or maybe you Forced March (SoD 8) someone who is currently holding a Curse (FG 8) and they eliminate you on their turn. It’s a lot of fun, and I’d say if you’re looking for a good follow-up to the amazing Vorpal Sword, Staff of Dragons adds a lot. This is my favorite chronicle so far. I love that there’s one deck I’d love to play standalone, and another deck to combine with my favorite deck to make it near-perfect (sorry False Rumors [FG 6], but I’ve moved on a bit). I would highly recommend getting this if you feel like Lost Legacy is starting to get a bit stale on you, as each set changes the game significantly and in unpredictable ways, which I suppose was kind of the point all along? 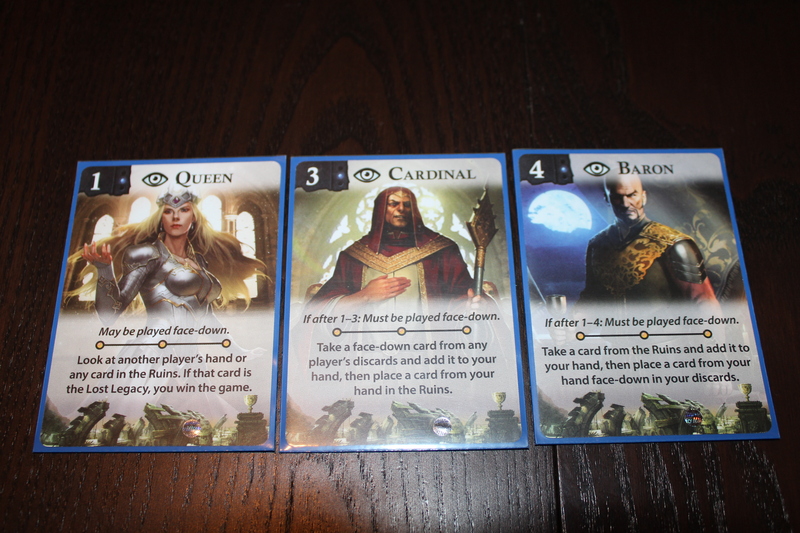 But in either case, I think this is the best set of two decks they’ve produced, since Whitegold Spire was so weird. You can try combining Sacred Grail with other decks (maybe The Starship would be fun? ), but I haven’t really felt much motivation to do so. 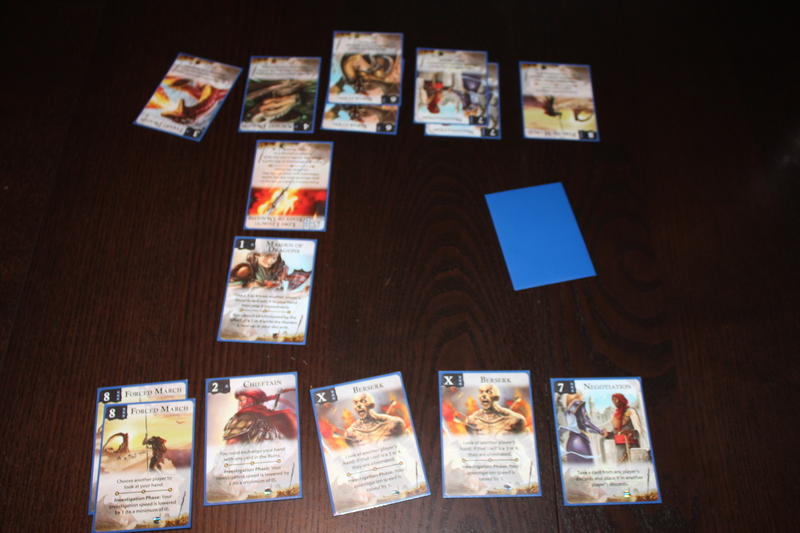 Posted in reviewTagged aeg, alderac entertainment group, board game, board games, card game, card games, competitive, competitive game, lost legacy, microgame, modular game, tabletopBookmark the permalink. i love this website to death because ALL your taste and opinions coincide with mine! the webpage design is fantastically slick and i especially appreciate the systematic layout of your reviews segregating the descriptions, pros & cons. your scoring system is also on point with what id rate most games! thing is, i own a lot of the games you’ve recommended except for lost legacy. however ive played love letter to death and it’s honestly getting very stale for me. 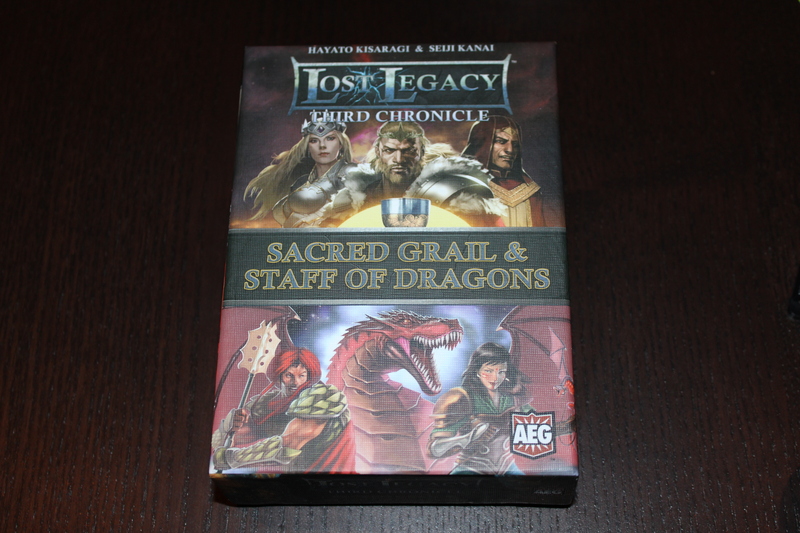 Ive not bought a single lost legacy deck yet, do you think it’s advisable to start with the third chronicle? it’s the highest rated overall among your lost legacy reviews! Yeah! Go for it. I’d pick up Flying Garden as well, though. Second Chronicle is great, but Whitegold Spire isn’t my favorite. You could also start with the Fourth Chronicle, which just came out, but I haven’t had time to review yet.